I exported a categorical raster from R and loaded it into ArcMap to visualize it. However, the attribute table is greyed out. Code In R: I first tell R that the values are factors by ratifying it. 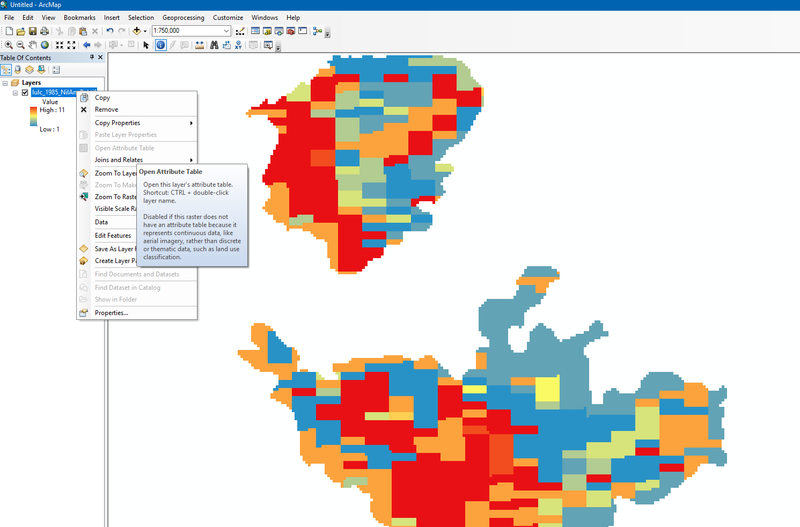 The raster is now visualized in ArcMap, where the attribute table is greyed out. How do I retrieve this attribute table? The exported .tif is just 13kb in size. Browse other questions tagged arcgis-desktop raster arcmap r attribute-table or ask your own question. Drop-down not showing on attribute table after I set a GDB domain? ArcMap 10.3 Attribute Table Showing Wrong Information?